People recognize how special this home is as soon as they see the water element that lies at the front of the state. It’s simple, impressive, and a clear indicator of great taste. People are even more impressed when they have the chance to see more. The property’s interiors are a perfect combination of form and function. The numerous independent sub-structures within the home ensure that every guest has privacy. That said, there’s no artificial sense of distance. Guests can easily interact with one another if they would like to. 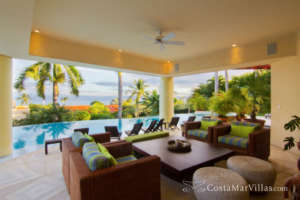 Ranchos Estate is part of the world-famous Punta Mita development. This highly exclusive development can be found in a secluded area, on the northern side of the Bay of Banderas. It’s the location of the most stunning homes in our portfolio. The guests that say here will have the opportunity to enjoy world-class service from the staff serving their home. Guests can privately relax in a comfortable and beautiful environment. The home can be found just a few feet above the stunning white sand beach. In the main building is a kitchen that would make any chef green with envy, a dining room and a living room. The decor of the home is excellent, but functionality and comfort are still priorities. The master bedroom is housed in a stand-alone 2 story building. In this building is a large bathroom with enclosed showers and a Jacuzzi, a spacious walk-in closet, an office with a terrace and a comfortable sitting area. The other bedrooms both have ocean views and their own terraces. These rooms can be found on the third building’s first and second floors. 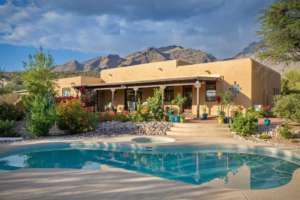 Both rooms have walk-in closets and large bathrooms with a Jacuzzi and shower. Each bedroom also includes its own refrigerator and private safe. Beyond the three additional bedrooms, the house has an in-house theater, an array of equipment, a gym, and a service center for the staff. These quarters can be found on the first floor of the fourth building. 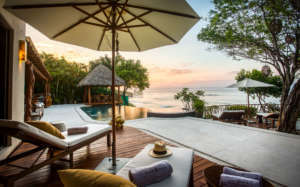 With six bedrooms, this villa is able to accommodate a total of twelve guests. Every room can include either a king bed or two single beds. In addition to this, each room has an en-suite bathroom with a shower, AC, a refrigerator and a TV. The crisp linens may make you think of a luxury hotel. 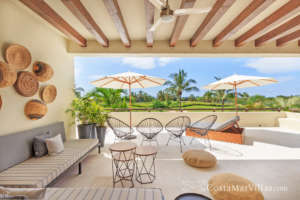 Since the bedrooms are spread between three casitas, each of which are seperate from the main home, every room feels like its own private retreat. If you need additional accommodations, there is a staff bedroom with two single beds that can be used. Do you want to enjoy the relaxing vibe of a rural fishing town while also enjoying the luxuries and mild weather you can find on the Rivera. You can enjoy all of this at Punta Mita, also with whale watching, diving, surfing, sport fishing, sailing, kayaking, hiking, mountain biking, horseback riding, rainforest excursions, Jeep tours and championship golf. If you walk into town, you’ll be able to enjoy stunning ocean sunsets as you dine at a beachfront restaurant. You’ll be swept away by the charm of Estate Jaguar!